Three small but such powerful words, sought after by shoppers and designers all over the world. Indeed, thanks to Italy’s glorious design heritage and reputation for style and innovation, products made in Italy enjoy a high profile and exclusive feel. This is of course one of the reasons all our jewellery is designed and made in this iconic country; since Tesoro is all about unique and elegant designer pieces to the highest of quality. Quality over quantity – in every sense; our pieces are limited edition and manufactured in only a few examples each, making each collection distinctly unique. The other reason our jewellery are created in the country of Italia is because Italy is simply in our blood; Italy is our heritage. As a family business for more than 40 years, we were founded by our grandparents Francesco and Rina right in the hills of Tuscany, many years ago. 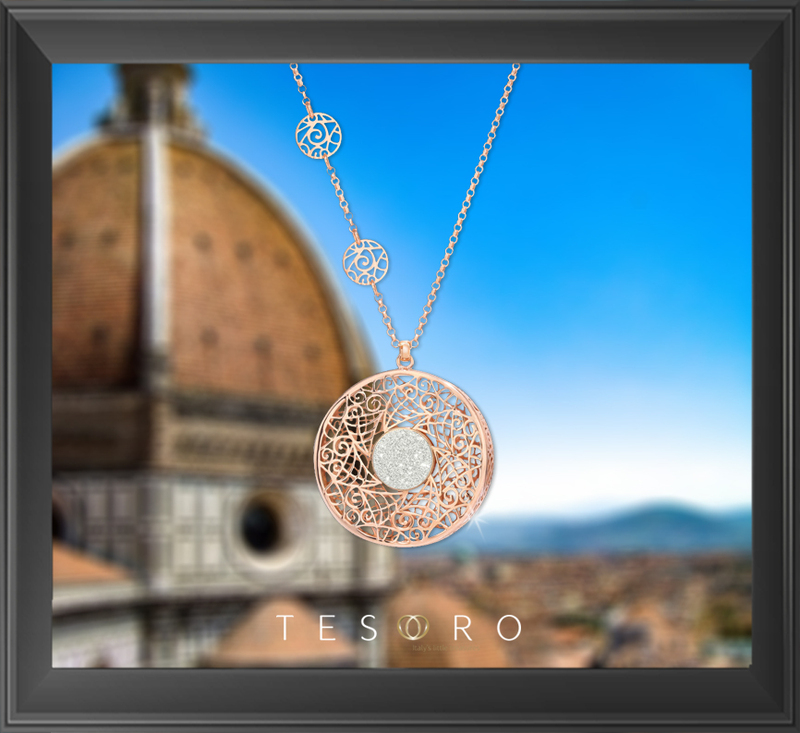 Our grandparent’s love for Italy and their love for jewellery created what Tesoro is today. We are indeed proud and grateful of both our grandparents and founders, and our Italian heritage. But what is it that makes Italian design so very special? Italy is an old country, full of incredible history. Art, design, creativity and aesthetics have been the hallmarks of Italian culture since ancient times. In essence, a person who lives in Italy is exposed to art daily — through architecture, through literature, through design, through fashion. That means Italians live and breathe fashion and design on a daily basis, making us immensely passionate and confident about our talents. As prestigious Italian architect Luigi Caccia Dominioni famously claims; “Quite simply, we are the best” , “We have more imagination, more culture, and are better mediators between the past and the future”. Whether true or not, fact stands that Italy is recognized worldwide as being a major trendsetter and leader in design. Several top French brands, such as Louis Vuitton and Hermes, even manufacture their own products in Italy rather than their home country France – due to the Italian craftsmen’s great well known capabilities to produce excellent quality. Such quality and exclusive modern Italian design is what Tesoro is all about. Our mission is to be creating distinctive, exquisite pieces for women all over the world to wear and treasure, giving them a piece and feeling of Italian elegance. Giving them the chance to wear something much more than merely a fashionable and elegant choice of adornment: The chance to wear a piece of rich history and incredible art. The Magical Tesoro Story Of Love.